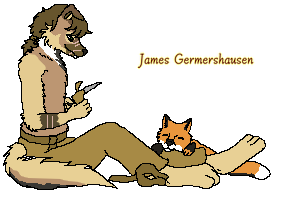 James stretched and sighed, for once his sister stayed behind, staying at a small camp they had set. They stayed nearby the pack of Mistfell Vale, but he was becoming restless. They needed new supplies, and though he wasn't as good at hunting as his twin sister, he could still get enough for a meal later today. Truthfully he could be a bit green-eyed when it came to viewing his sisters skills. In the long run though, he knew he had skills that she did not, and that they balanced each other out pretty well. Smiling to himself he caught the light trail of some animal and started following it. His pace was easy going and he didn't seem to be in a hurry. Mostly because he wasn't, they needed food sure, but if he didn't catch something, he knew there would still be food at the camp to eat. Jesse was good that way, not really expecting him to catch anything, so she always had something for them to have. It didn't bother him, as he knew he missed more than caught any meal he may try to take down. For a moment he paused, catching the scent of someone nearby, with the added hint of the Mistfell pack added. Curiosity now roused he headed more towards the scent than towards the potential meal. After some walking he found himself looking at a common grey looking fellow, with bright orange orbs. Felling his heart rate pick up he grinned brightly and his tail wagged "Hallo!" he greeted, giving a wave of his hand to the other and hoping he had not disrupted anything important. Malfoy had caught the scent long before another male appeared and gave a cheerful greeting. Perhaps a bit too cheerful, seeing as he was a stranger. Frowning he looked over the other male and pegged him as a common dog. Most likely a loner as well, though most loners did not so eagerly greet random people. What was he supposed to do, just say hello back? Well, he supposed that was better than just staying silent right? "Hello" he offered back, then looked to the task he had been doing. Before the interruption he had been hunting down a deer, hoping to down a newborn, though it may still be too early for such a task. Seeing that his target had left, likely scared by the other more cheerful canine he grumbled to himself and sent a glare to the other. "You chased away my prey" he said and huffed as he allowed his bow to go relaxed and put away his arrow. He could track it back down, he really wanted the pelt that a young deer could sport, plus the meat would be welcome after the long winter. So ignoring the other for the most part he went to find the tracks that his target could have left as it escaped deeper into the area. James whimpered lightly and lowered his ears. He had not meant to chase prey away from this other male "Sorry...I can help you track it back down?" he felt bad for ruining the hunt. Gaining a bare nod from the other he perked right back up and followed the grey wolf looking male. Staying silent he scanned the ground for what sign he could find for any animal nearby. The other male looked to be doing the same, though it seemed that he was a lot better at it then James himself. They went in silence, not really needing to speak as the other pointed out the trail and James nodded in understanding. It was like hunting with his sister, the familiarity had him relaxing and enjoying the activity. When the grey wolf looking male paused, James did too. Looking ahead he spotted the prey, a deer that was separated from it's group. James guessed it had been separated earlier, and then he had spooked it. Getting lower to the ground, he had no weapon that could help, but he could hide a little and stop it from escaping again. His ear moved as he heard the sound of a bow being drawn, soon followed by the release of a arrow. Watching with wonder he saw the arrow hit and then the grey wolf run towards the now moving deer. The hunt was truly on now. James moved as well, trying to head off the now injured and wild eyed deer. Malfoy had agreed to let the other male help, but only because having back up was a wise idea to him. The other male at least knew how to be silent, and seemed to know how to follow tracks. At the same time though, he could tell that this stranger was used to following someone else when he hunted. The way he continued to look at Malfoy was a sign that he was following cues and seeing Malfoy as the leader. That was fine by Mal, and the grey male looked to the young deer as they caught up and got his bow and arrow ready. Looking to the other, he saw that the other male had done his best to hide in some foliage. Commendable. Making only the smallest adjustment he let the arrow fly at his target and saw it strike. The deer moved to run from the pain and Malfoy gave chase. He heard more than saw the other male move as well and together they ran down the deer, who did slow after a few moments. The arrow had struck the neck, and hopefully a vital spot if the slowing was any sign at all. Smiling just a little he got another arrow ready and sent it flying at the deer as the brown male nearby could be seen at the other side of the deer. Good, perhaps together they could take down the scared animal.